George Osborne's swingeing tax credit cuts of £3 billion may have contributed to the dire Q2 downturn, the Child Poverty Action Group said today. George Osborne’s swingeing tax credit cuts of £3 billion may have contributed to the dire Q2 downturn, the Child Poverty Action Group said today. It was announced this morning that the UK economy shrank 0.7 per cent in the second quarter of this year, the third consecutive quarterly contraction, the worst double-dip recession for 50 years. “An international study looking at which countries recovered fastest from recession in 2009 found it was those giving the biggest stimulus to the incomes of the poorest households. “This is because low income families spend their money straight away in their local shops and services, helping struggling businesses to survive. “The size of the contraction is perhaps less surprising when you take account of the £3 billion of cuts to tax credits that hit the poorest working families this April. Left Foot Forward has long reported on the false economy of the coalition’s cuts to tax credits. To allow households to gain a better understanding of what the changes mean for them the TUC has launched a tax credit calculator, which shows how changes to tax credits will affect household entitlements over the years ahead – and exposes the reality behind today’s rhetoric about winners and losers. • A single parent earning £30,000 with an 18 month old child who pays £150 a week for childcare 45 weeks of the year will lose £1,277. • Families on middle incomes who will lose the entire family element of their award (worth £545). Even after gains from the raised income tax threshold (which has already been countered by VAT and NICs rises) are taken into account, many low and middle income households with children will be significantly worse off. The coalition’s policies carry on hurting – but they still aren’t working. 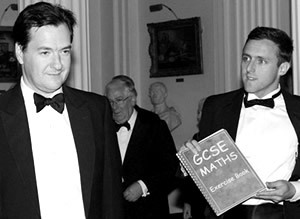 No doubt about it—Osborne is the worst Chancellor since Philip Snowdon (1931), and possibly since Churchill (who put us back on the Gold Standard in 1924, causing a deep recession).